This is another Indian oil on this list. Despite the characteristic smell, it is recommended and used by many women worldwide. What effects can a treatment with this product bring? The best you can do is to try it out yourself. See how it works and what the properties of Dabur Amla oil are. Dabur Amla Oil is recommended for normal hair, dry and damaged. It has moisturising, regenerating and strengthening effects. It contains many natural substances, and among them: sesame oil, bamboo oil and peanut oil. Sesame oil prevents premature graying, prevents hair loss, protects against solar radiation, helps fight dandruff and other scalp diseases. Dabur Amla deeply nourishes hair, provides a natural glow and soothes irritation. The product also contains ingredients to combat free radicals, and an extract of Indian gooseberry, in other words – amla. Fruits of amla regenerate split ends, strengthen and restore damaged hair. Unfortunately, Dabur Amla can also find artificial colours and fragrances. They can cause allergies especially for people with very sensitive scalp. How to apply Dabur Amla? Dabur Amla is ideal for hair oiling treatment, which is a traditional Indian ritual of care. A larger amount of the cosmetic should be applied on the entire length of the strands and at the hair roots. Leave it in for about an hour; during that time the nutrients contained in the cosmetic penetrate the follicles and internal structures of your hair. After this period of time wash Amla Dabur oil off with a gentle shampoo. However, if you applied more oil than it is recommended by the manufacturer, you may have a problem with washing the strands. What to do in such situation? You have no other choice but to repeat the cleansing process. Additionally, this Indian product can also be applied on the hair ends. Thanks to a regular treatment, you hair will become healthier and more beautiful. 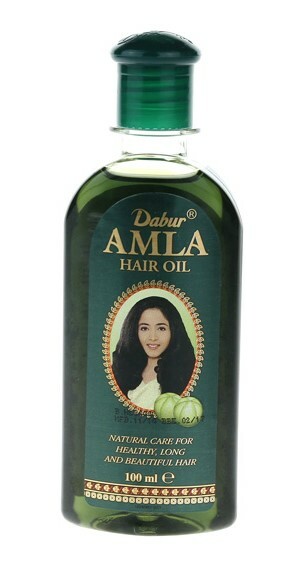 Amla Dabur oil will mostly appeal to those people who have very damaged hair. The skin of your head becomes greasy very quickly? Reduce the amount of oil which you apply on your hair. This will prevent the appearance of dandruff and other skin diseases. If you are a fan of oiling hair, you can also use Amla Dabur. Perform the treatment the way professional hairdressers or Indian women do. One pack with a capacity of 200 ml is enough for dozens of applications. Moreover, bottles containing 100 ml and 300 ml of this cosmetic are also available online. If you do not mind the intense scent, you can freely use this product. You will definitely be happy with this treatment.